Are you looking for a professional cleaner to remove that pesky urine smell? At JL carpet cleaning we offer a specialist pet odour removal service and pet stain removal service. As close companions to us, our beloved cats and dogs however well trained can sometimes have accidents. Sometimes we can catch them in the act but unfortunately, we occasionally miss the odd one. Then we don’t realise anything is wrong until the stain has dried and we get a whiff of the dreaded smell. Once that’s happened it can be hard to locate the source of the smell and not everyone fancies crawling around on your hands and knees searching for pet pee. The last thing we want is to know is suspected pet or even human urine is present in our carpets. So How do you find the urine contamination? We use special dark light technology to search for the urine deposits and help in urine decontamination. 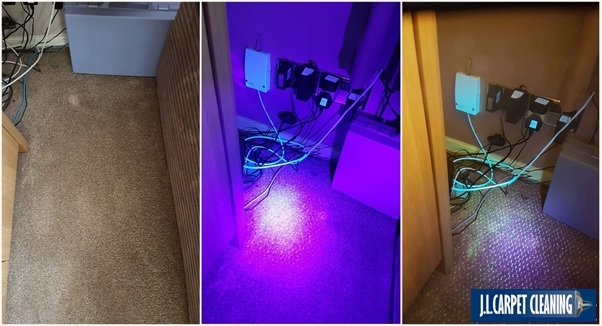 As urine dries is becomes visible under powerful UV light. The stains aren’t present to the human eye, but using specialist uv technology, we are able to locate the source of the pet odour problem. See the image below. The stains invisible under normal light, but under our uv light it becomes visible. So what does urine decontamination involve? When fresh stains occur its best to act straight away to remove them. As urine dries it turns alkaline creating those yellow marks we see. On wool carpets if left untreated, this can be problematic. Bear in mind it’s possible to hygienically clean the area but removing the yellowing can never be guaranteed. There are various options available to help banish that odour. 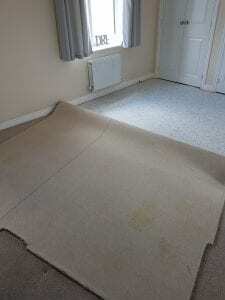 Minor stains and some medium contamination may be able to be treated without lifting the carpet using specialist products and techniques. Major contamination will require the carpet uplifting and possible underlay replacement. Followed by decontaminating the affected areas to remove the odour. The following treatments below can be used for BLOOD REMOVAL, FECES REMOVAL & SICK REMOVAL. This is because the same process applies. Please note due to the bacteria present from these types of treatments, we have to charge for sanitising our equipment after the job for health and safety. 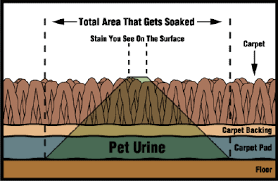 Scenario – Small urine / blood stain present on top of the carpet. The stain has not yet worked its way into the carpet backing or underlay. Scenario – large urine stains which have been present for a few days or have passed into the backing. Smell can be smelt on entering a room. Sub surface treatment – Using a specialist sub surface tool the areas are saturated with professional odour neutralising products. On contact with the contaminated areas these break down the bacteria and are flushed out. Check out the video below to give you a better idea of what we do. Using a sub surface tool we remove as much moisture as possible. The area is flushed with water and deodoriser applied in the same way. We complete the job with an application of a anti microbial product. Scenario – Large urine stains or blood which have been present or have passed into the backing. Smell can be smelt on entering a room. Full treatment – This treatment virtually eliminates all odours and is the best and most through method to rid your house of the odour problem forever. This is our most through treatment. Leaving your home clean, fresh and odour free once more.